Hello! 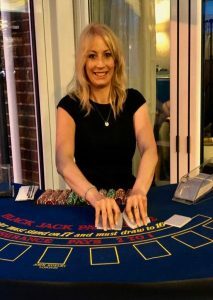 I’m zoe and am the founder/owner of little Las Vegas fun casino hire. After dealing in casinos and fun casinos for 17 years, I decided it was time to set one up for myself – and I haven’t looked back since. I love what I do, and this is reflected in the service we offer. People choose Little Las Vegas when they’re looking for a personal and professional service but for a realistic price. Have any questions, would like to know more or would simply like a quote? Why not leave us a message using the form below.